Out of every pet, cats have the unique trait of always, always getting into trouble. 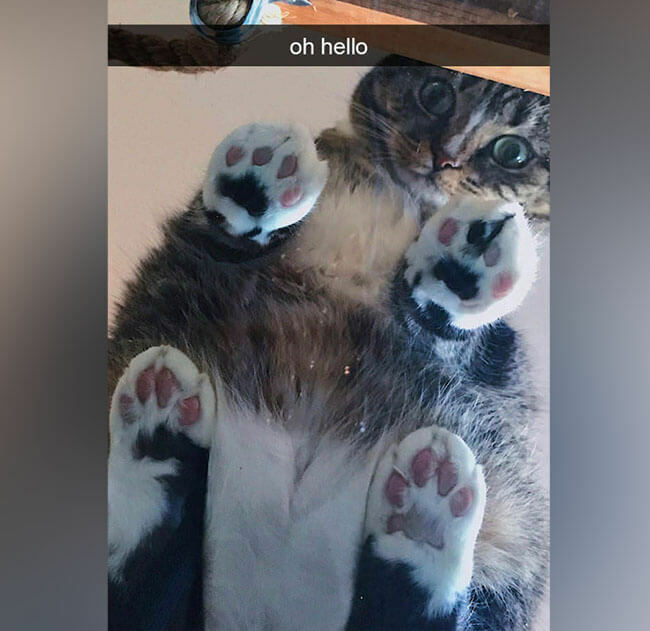 Whether it’s getting stuck in a vase or being chased by a bear, these cats who ended up on Snapchat found themselves in a sticky situation. Is it mean to laugh? 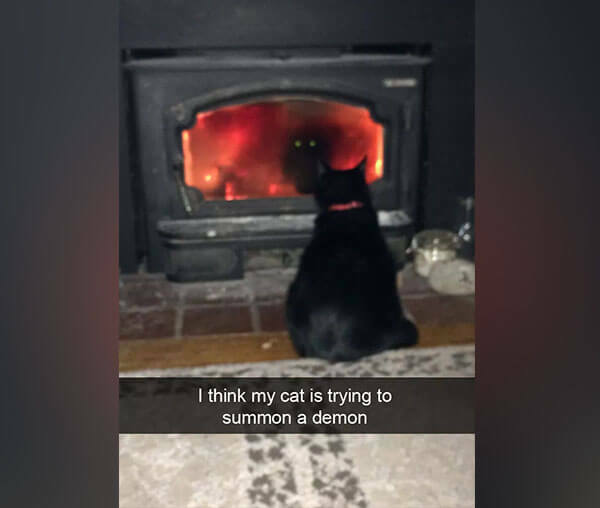 We don’t expect our beloved fur babies to be summoning things from the depths of fiery unknown, but our kitties don’t always grow up the way we want them to. This incredible snap has caught a rare moment where this witchy black cat is either practicing for a role in a horror film or straight-up staring into a gateway to Hell and asking his feline brethren to come up to play. What happens when you finally turn off the stove? We don’t want to find out. Perhaps it was just a passing moment of the kitty simply digging his reflection. It’s funny living in a house with multiple pets and watching them interact with each other. It’s undeniably entertaining when they take notice of another species and their curiosity gets the best of them. This kitty has absolutely no idea how ridiculous he looks hunting his beta-fish buddy. The crossed eyes, the tongue, the giant fishbowl head – it’s just too much cuteness to handle. The best part? The fish looks wholly unfazed. 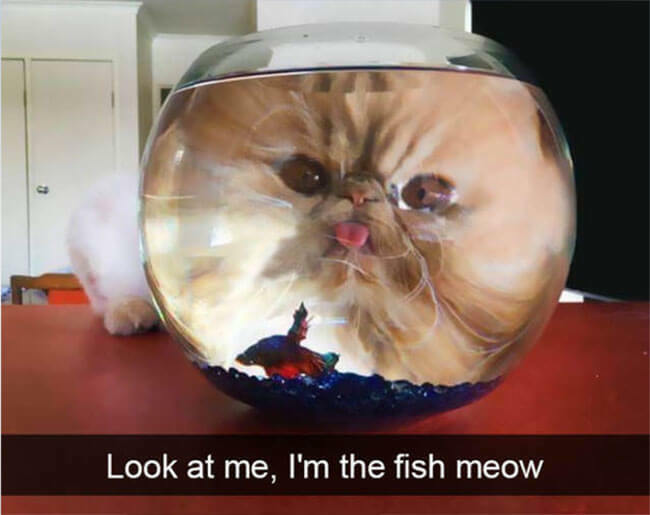 That cat may be plotting about how to get into that fishbowl, but let’s be real. Cats hate water. The fish knows, we know it, and deep down, that brave cat hunting a house pet knows it too. It’s a little-known secret that some cats have a hard time coming to terms with the fact that they’re actually cats. Since they spend almost all their time around humans (or making weird clicking sounds at birds outside of the window), it’s not really a difficult mistake to make. This kitty is convinced he’s an actual human child. 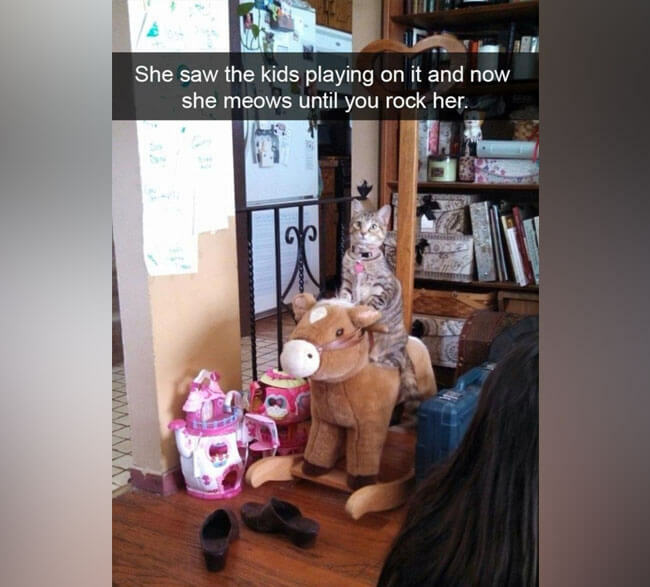 After seeing the human children thoroughly enjoying this rocking horse, she decided to give it a try. It’s what humans do, after all, right? Now, the poor little girl is addicted. She climbs up and meows until someone is willing play with her. Have you ever crawled out of bed for work in the near darkness of a chilly January morning, wrapped yourself in a zillion layers and stepped outside into a frozen hellscape screaming no, no, no, no? If you haven’t, you clearly don’t live in the North East. For that, we applaud you. For everyone else, it’s an inevitable evil of a climate that has seasons. 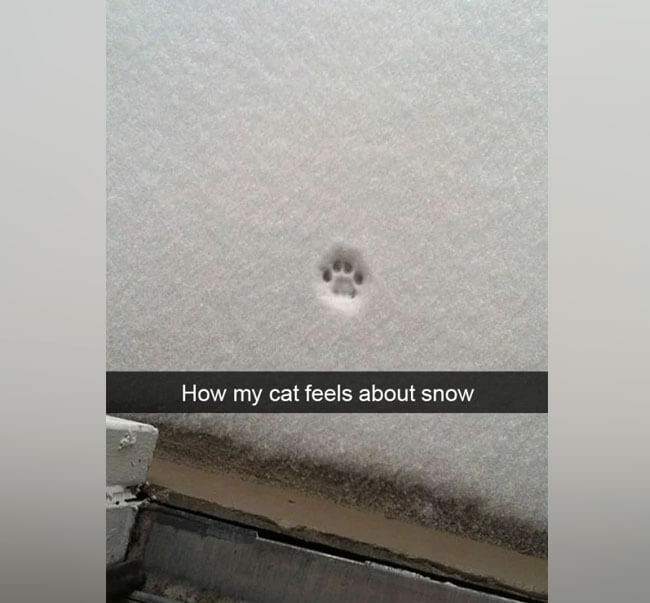 This kitty was feeling a similar vibe when he stepped out to frozen tundra and decided his life would be better off as a house cat. Who needs freedom if freedom means freezing? Mom, can I have some more tuna, now? Every cat owner knows that there’s nothing more sacred and holy than a feline’s little toe beans. The four perfect little beans allow our beloved cats to appear out of nowhere, completely unnoticed (like say, in the middle of the night when we feel a wet nose on our face asking us to play.) It allows them to land their sometimes clumsy jumps without serious injury, like in the instance of leaping from a bed while they have the zoomies. It also gives us something to squish and to hold. We can’t thank the inventor of glass tables enough because it’s simply the cutest way to observe our babies’ paw pads. Cats get a pretty bad rap for being difficult, anti-social pets that don’t play nice with others and don’t possess a bone of unconditional love in their tiny bodies. It’s unfathomable because some kitties are totally cool with going with the flow and will do anything to make their owners happy (until they inevitably snap and start moaning about it.) Case in point: This adorable furbaby who’s pretending to be an actual baby doll. 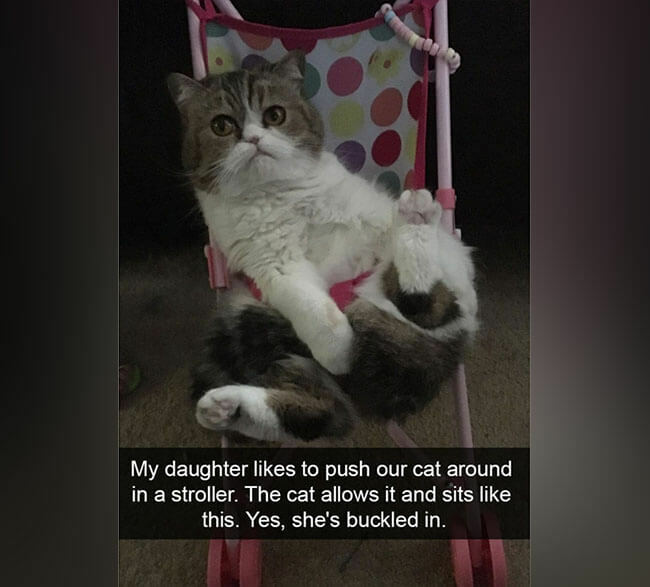 This Snap captured a too-sweet moment where a young girl’s beloved kitty appeased her owner and allowed her to cart her around in a stroller like she was a toy. She even let the girl buckle her in. If that’s no love, what is? It’s hard to tell exactly what this cat is running from. Perhaps he got caught on the wrong side of the law. Maybe he murdered a bird or took a catfight a little too far and needed a speedy exit. Maybe he robbed a family of their fish dinner while it was still on the grill. Either way, this unwitting human just became an accomplice. Everyone knows that you don’t choose to adopt your cat. Your cat chooses to adopt you. 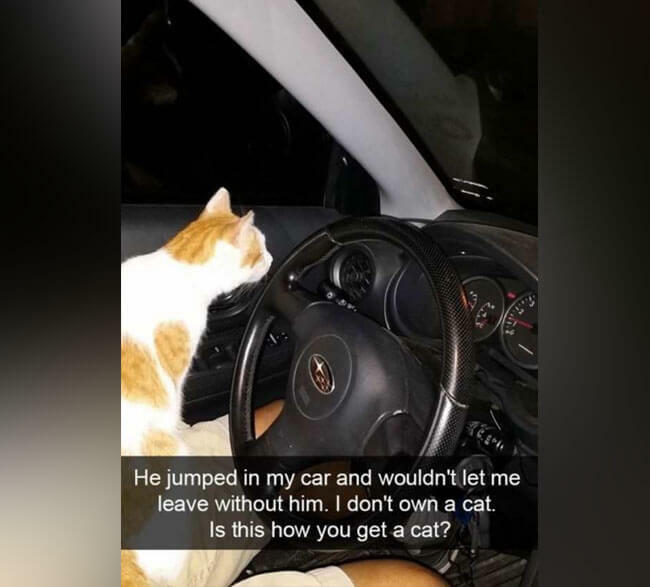 In this case, the cat bandit needed his new human to drive away fast. We hope he’s at least familiar with Grand Theft Auto because it’s a pretty safe bet he may be dodging the cops for his new found furry friend. For some kittens, a laser pointer simply isn’t enough. They live in a world of imagination – at least that’s what it looks like. 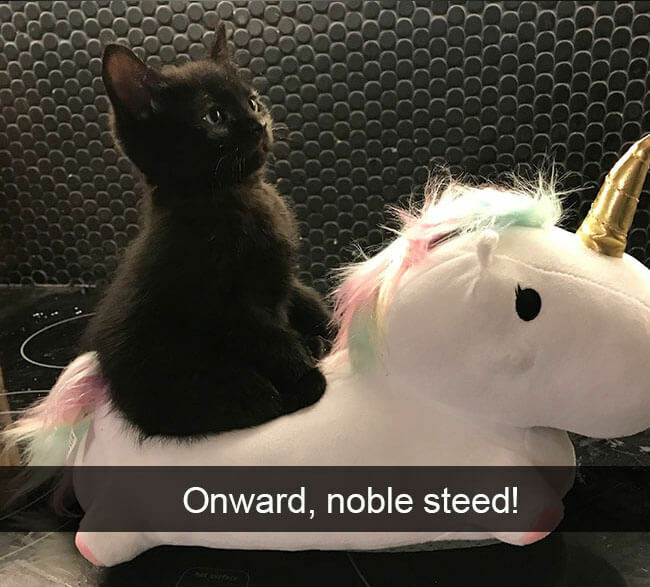 This adorable black kitty got right up on this unicorn toy and is surely imagining an epic adventure through a magical fantasy land. On the other hand, if it fits, he sits. The cat might not be playing around at all. He simply found the most comfortable seat in the house. Who knew a toy unicorn could actually get any cuter? It seems so unlikely, yet here we are. He’s going to be pretty mad when he realizes he’s going nowhere fast. We remember history so we don’t ever repeat the bad parts. The fact that Hitler was directly responsible for the death of millions of Jewish people is a tragedy that should never be forgotten, and Holocaust jokes are also among the most unfunny there are. It will always be too soon. With that being said, it’s hard to ignore this particular cat’s facial hair preference. There’s a reason we don’t see mustaches like this around anymore. One terrible guy ruined the style for everyone (including Charlie Chaplin fanatics.) Yet, here this kitty is. Someone needs to tell him. Snapchat’s filters are the app’s Holy Grail. It’s really the only thing they’ve got going for them over Instagram Stories (let’s be honest – Instagram’s filters can’t hold a candle.) The unfortunate thing is that Snapchat’s face filters are catered towards human faces, which means it’s not very often our furry friends can partake in the fun. Every once in a while, a cat’s face will trip the filter, and we get true Internet gold. This Snapchat user’s cat must have the perfect facial proportions because it’s living for Snapchat filters. As one user put it, it’s something straight out of a bad anime – but we can’t help but watch. In ancient Egypt, cats were regarded as other-worldly figures. They were Gods among men whose grace, poise and ability to keep rats away was unmatched and worthy of celebration. Today? Not so much. 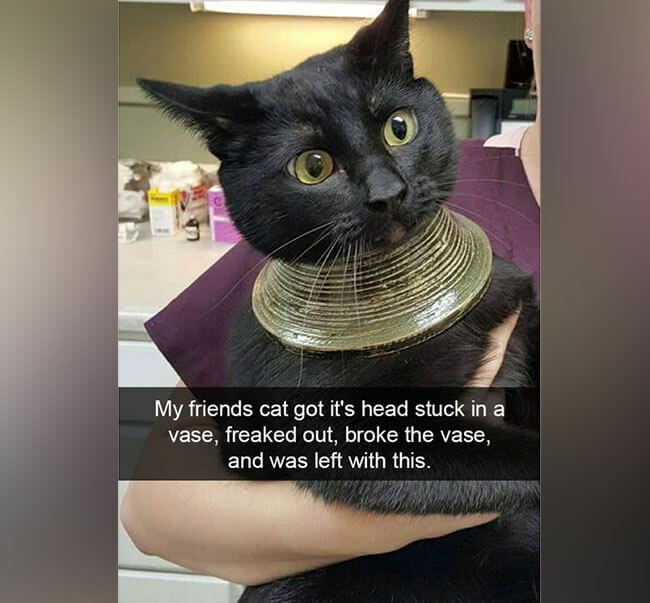 This Kitty may look like he’s gearing up for a Cleopatra-themed costume party, but his epic look was a clumsy accident – anything but regal. 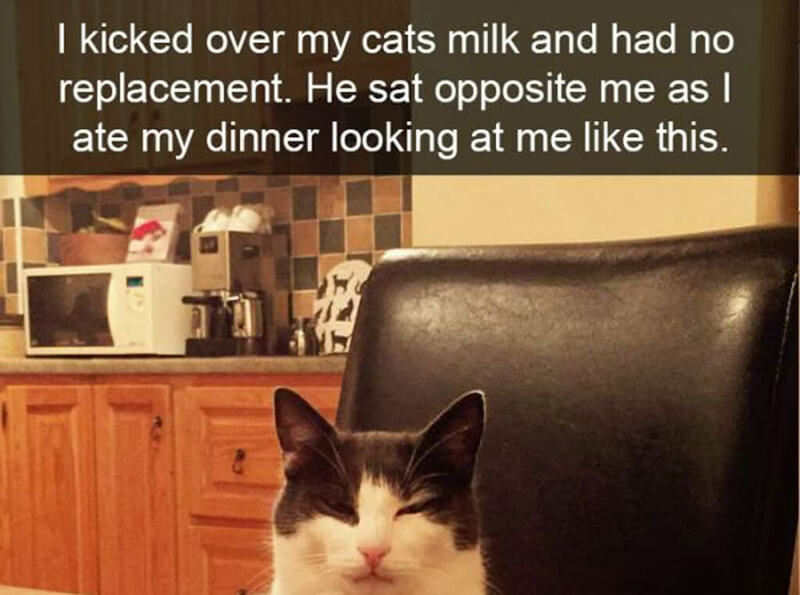 This clumsy cat was pretty creative when it came to backing his way out of a major problem. After getting his head stuck in a vase, he attempted to smash it but missed the part around his neck. At least he’s totally pulling it off. Scientists have yet to figure out why cats sit where they sit. We buy them beds, comfy blankets, and cat towers, yet they always manage to relax in the most uncomfortable spot imaginable. This kitty is absolutely no different, though she may just be practicing for her next life as a hen. According to this kitten’s owners, they’ve got five beds and 10 chairs in what we can only assume is a pretty large house. 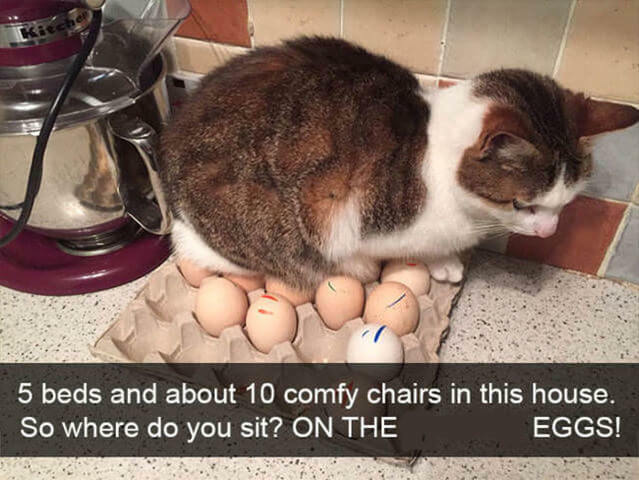 Instead of opting for any of those normal places, this cat chooses fragile, inconvenient eggs. Maybe she just wants them to hatch so she can have some chicks of her own. Cats may not seem like the best listeners. They sit on your lap and blankly stare at you – if they even acknowledge your presence at all. Most cats just straight up ignore our presence, unless we’ve got a laser pointer or some treats, but not this adorable little baby. 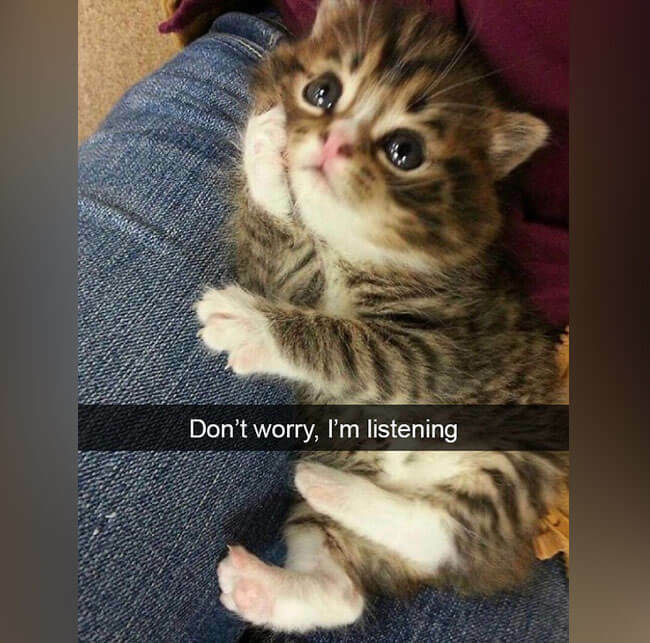 This kitten has a future career as either a psychologist or a gossip columnist. She’s patiently staring at her owner, enthralled in every word of her story. Maybe she’s talking about how salmon have an epic journey upstream. Maybe she’s talking about the birdies outside of the window. We’ll never know. Cats are not the most affectionate creatures. Unlike dogs, they don’t need our constant approval. They’re not looking to please. They’re simply looking to co-exist. That doesn’t mean they don’t love us, and the rare moment of affection proves it. This kitty absolutely adores his owner. 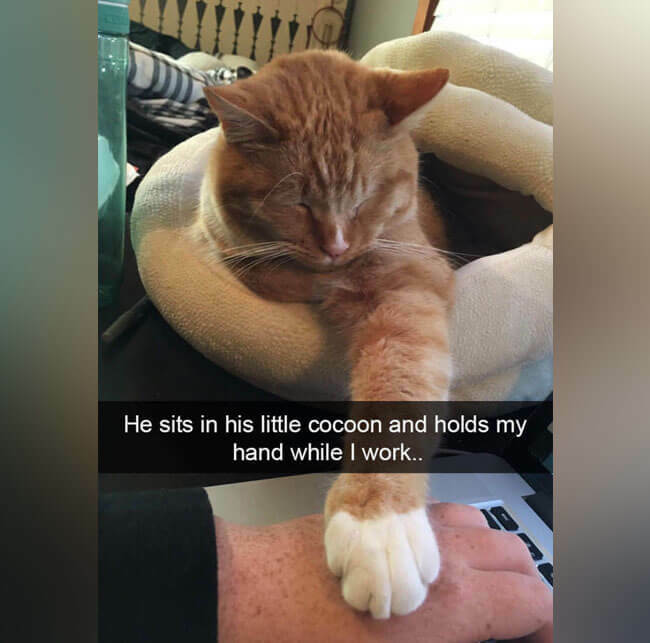 While he isn’t running up to cuddle (because he deeply values his independence), this cat expresses his adoration by reaching out a single paw and holding his human’s hand. Is there anything more sweet than those little toe beans? Ever wonder what an outdoor cat does while we’re not around to see it? Most of us imagine it lounging in our neighbors’ backyard or chasing around a couple squirrels, but some cats get into a whole lot more trouble than others. This kitten got a little more than he bargained for when he got into some kind of dispute with a wandering bear. Hasn’t Sandra told him to never talk to strangers? 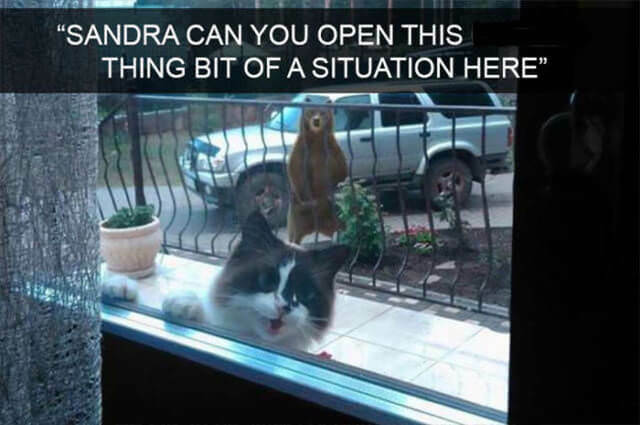 We’re guessing that as soon as Sandra opens that door, he’s going to have a very, very stern talking to. 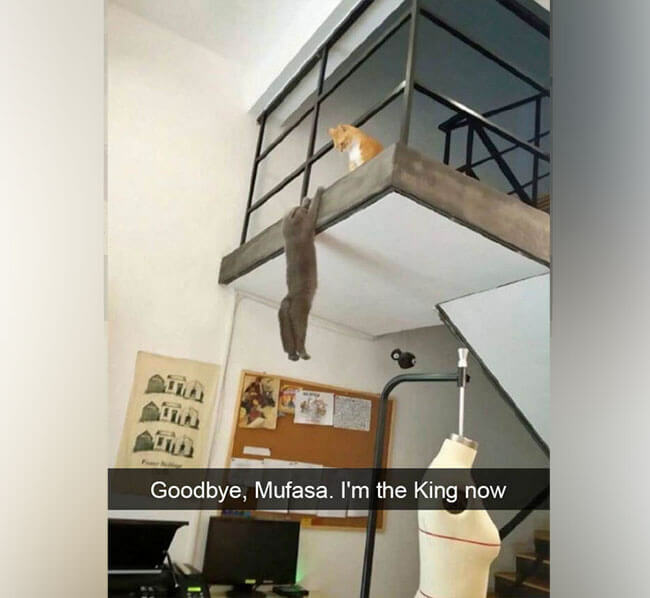 One cat owner was pretty horrified to find her fur babies playing out the iconic scene from The Lion King where Scar basically throws Mufasa to his death off Pride Rock. What Disney didn’t account for was the fact that cats always land on their feet. Mufasa would have been totally fine, as was this cat. Let’s be real: as cat owners, we’ve been known to spoil our cats. Usually, that consists of buying some toys they’ll play with for five minutes before getting bored and forgetting they exist. Sometimes, we bend our rules and allow kitty to have some human food and other times we endlessly pet our little darlings at their incessant request. Other times, things go a little too far. 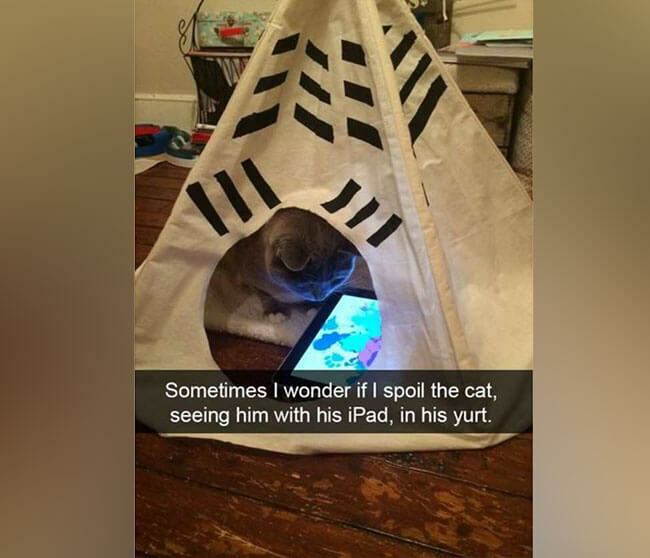 This owner realized they’ve spoiled their kitty only after they’ve bought him a fancy yurt to hang out in and an expensive iPad. There’s a high chance this spoiled kitty thinks he’s an actual human child. 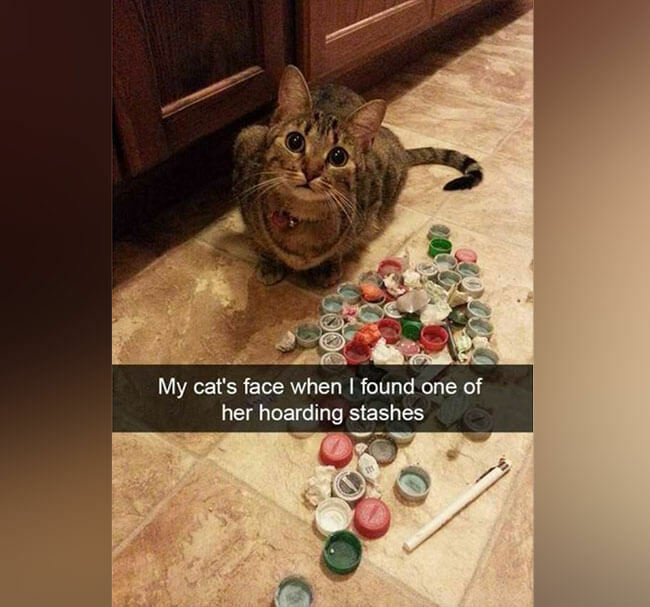 Every cat owner has had the delightful experience of finding their kitty’s secret stash. Cats love to store their favorite toys in covert locations like under a piece of furniture or behind a couch. They pile it up for months and months with everything from fallen bottle caps and paper clips to pieces of plastic from the tops of bottles, but what happens when you finally find what they’ve been hiding? 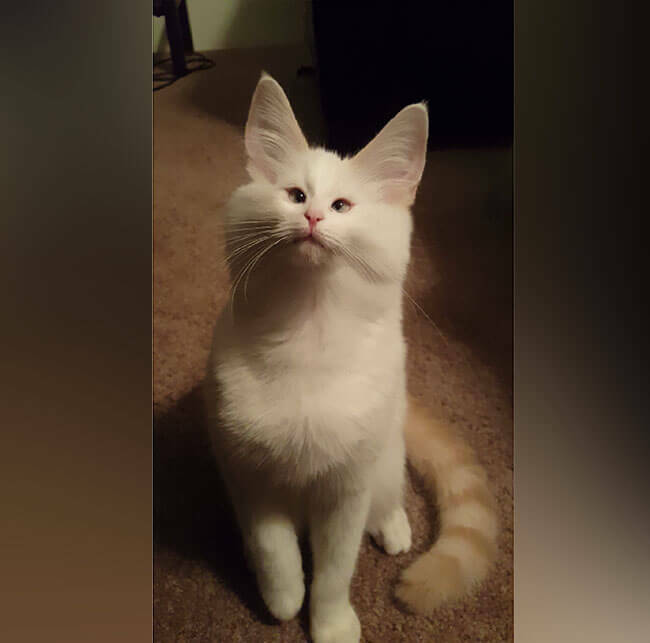 This cat owner found the jackpot and the jig was up for her little furbaby, who looked completely displeased with her owner’s realization. The loot included balled up pieces of paper, a straw, and some bottle caps. On the black market, this could be worth more than a few Fancy Feasts. Cats love to fit themselves in the weirdest places. They’re basically a liquid and effortlessly flow into the tiniest little places and in the weirdest positions. This poor cat was just doing his thing when he found out the hard way that you may not want to crawl into every open space. 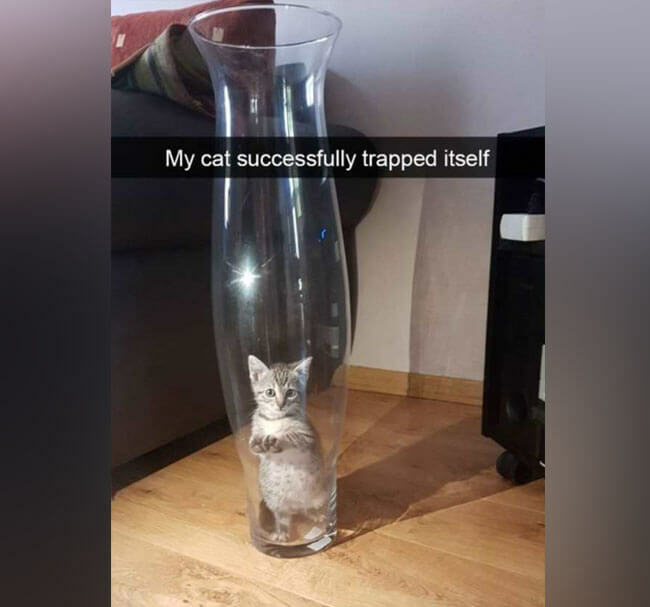 This kitten somehow found himself trapped in a really tall vase. The worst part is that he couldn’t even comfortably sit down because it was much too narrow. 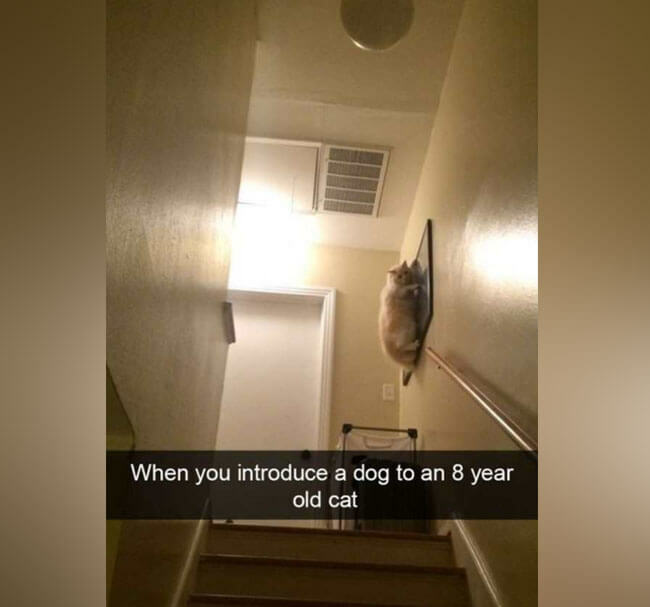 The look of embarrassment on his face will live forever on the Internet, though his owner was trying to be respectful by putting it on Snapchat where the embarrassment would eventually fade. The term scaredy cat came from a very real place. Some cats are straight-up terrified of everything that moves – especially big dogs (but we don’t blame them for that one). For some reason, this cat managed to live eight entire years before encountering a dog for the first time. Needless to say, it was absolutely terrified when it came across that playful – but loud – bark. Cats have been known to defy gravity before. They’re even more adept at climbing than Spider-Man. This cat launched himself into the air and clung to a picture frame. It may take a fire department to get him down. Looks like this fluffy feline has been getting into the kibble when their owners aren’t looking. Now, they can barely sit on top of their favorite cat tower without fear of causing it to topple over. By the look on this cats face, it looks like it already knows that it’s made a huge mistake by trying to get up there. Luckily, cats always land on their feet so we’re assuming that the fall won’t be horrible. Maybe this cat needs to start going on walks. 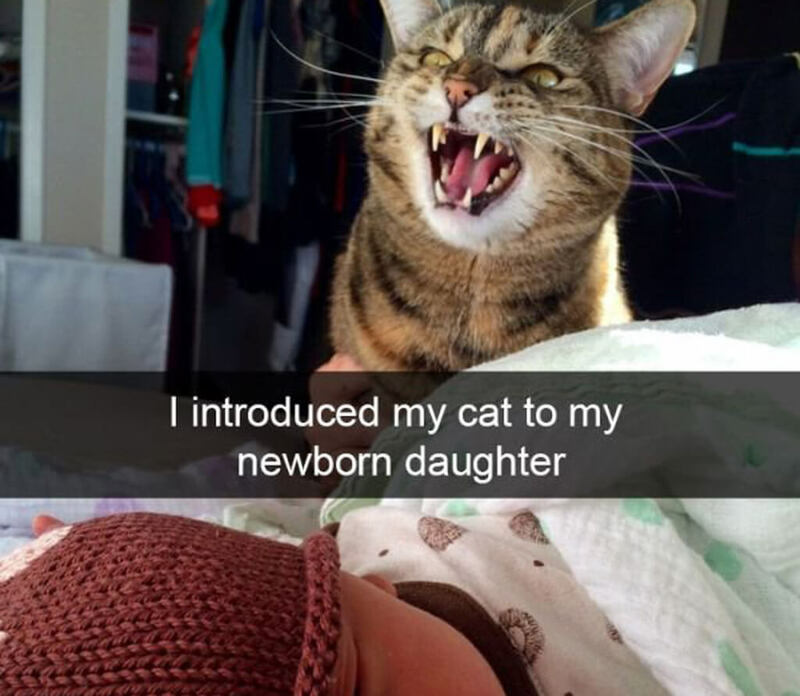 Looks like this will be the first and last time that the cat and the newborn are in the same room. At least, that would be the smart decision. 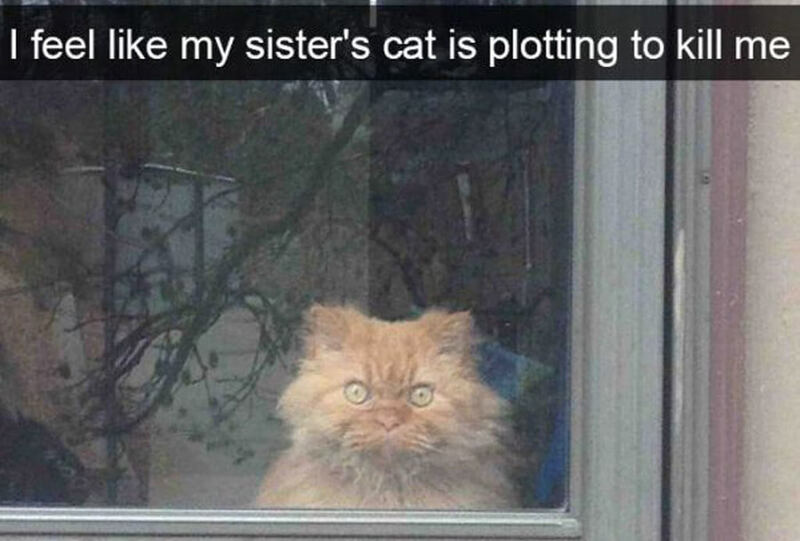 We all know that cats have the capacity to be evil, so we wouldn’t trust this one for a second. Anything that takes your attention away from the cat is bound to end up missing or dead. This cat looks like it doesn’t even want to develop a plan and is going in straight for the kill. Typically, if your cat sees you relaxing without them there to join you, you’re going to have a problem n your hands. Cats want all of the attention in the world because they like to know that they’re loved and that they’re the only thing you love. 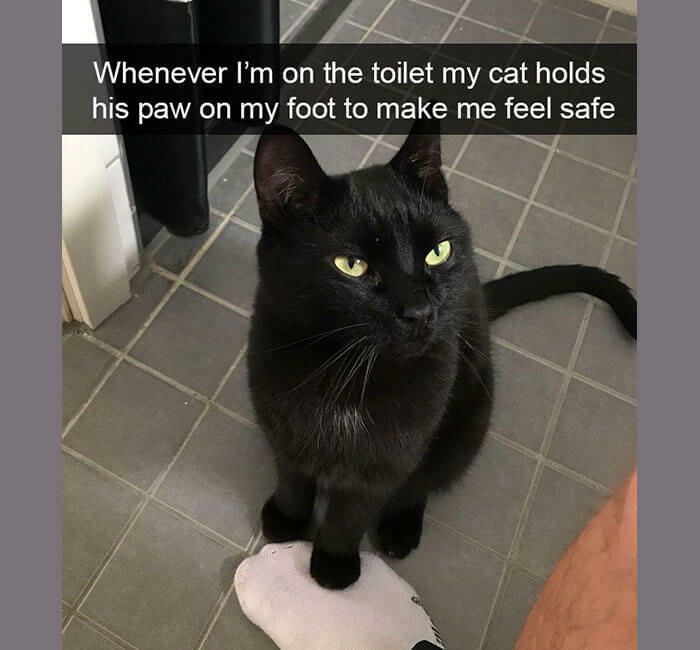 With this idea, the cat can still be as close to the owner as possible, while also performing a much-needed needed service for its owner. It even seems to be enjoying it. 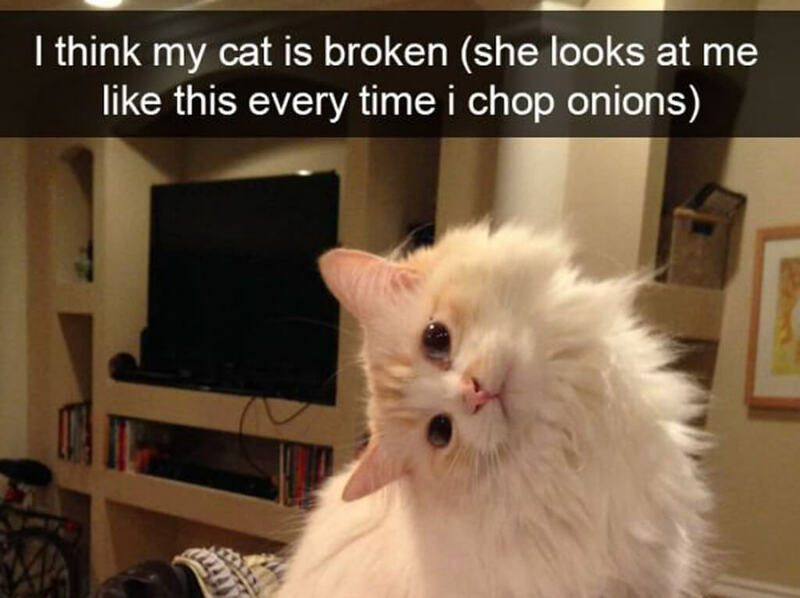 If my cat did this whenever I chopped onions, I would be chopping onions at all time. This cat looks absolutely adorable when it’s confused and we’re sure that the smell of chopping onions is enough to freak any cat out. Maybe you should get the cat a little pair of cat goggles so they don’t have to suffer through watching you chop onions anymore. Plus, it would look even cuter than it already does. It’s no secret that cats like to catch things and either hide them or bring them to their owner. But bottle caps? We’re not sure we’ve ever heard about that one before. 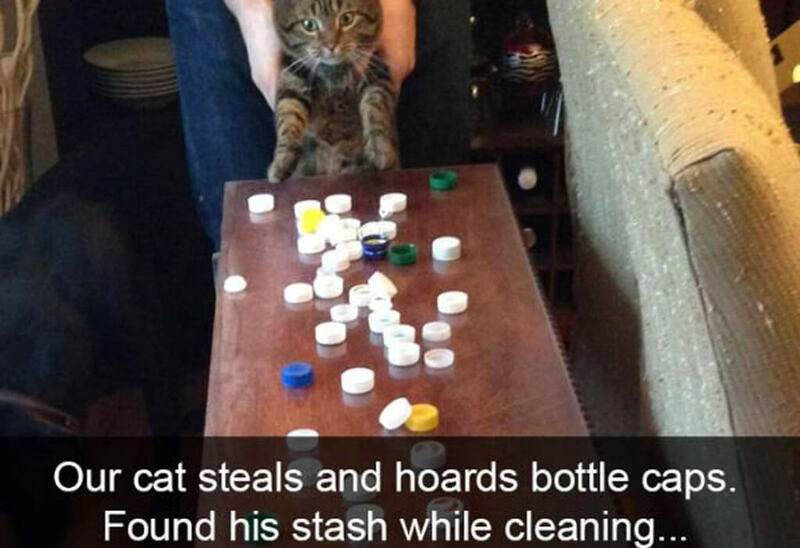 The real question is where did this cat even acquire all of these bottle caps? Were they all inside of the house, because if so, these people might want to consider to take it easy on their soda confession. The look on the cat’s face is also priceless because it knows that the jog is up. 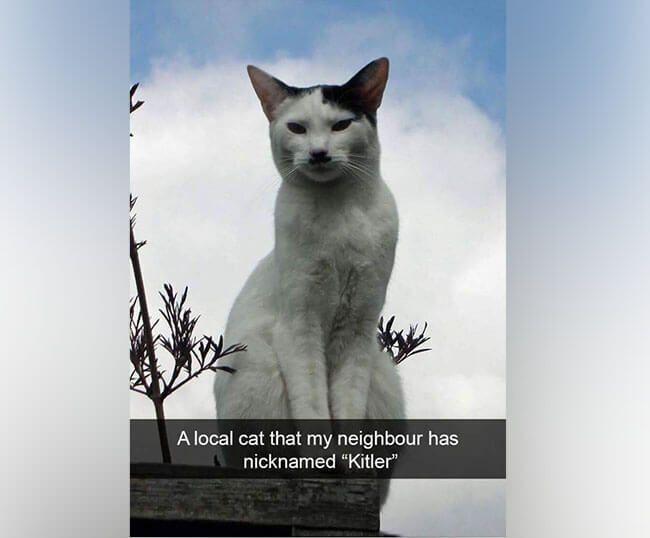 If I was this cat’s owner I would sleep with one eye open, because that cat looks like it’s plotting its revenge for its owner’s mistake. Kicking over the water probably would have been fine, the food, maybe. But the milk? That’s a big no-no. While some people might say that this picture was taken at the right moment, we all know that the cat was actually staring like this. Keep your eyes peeled or else who knows what might happen. 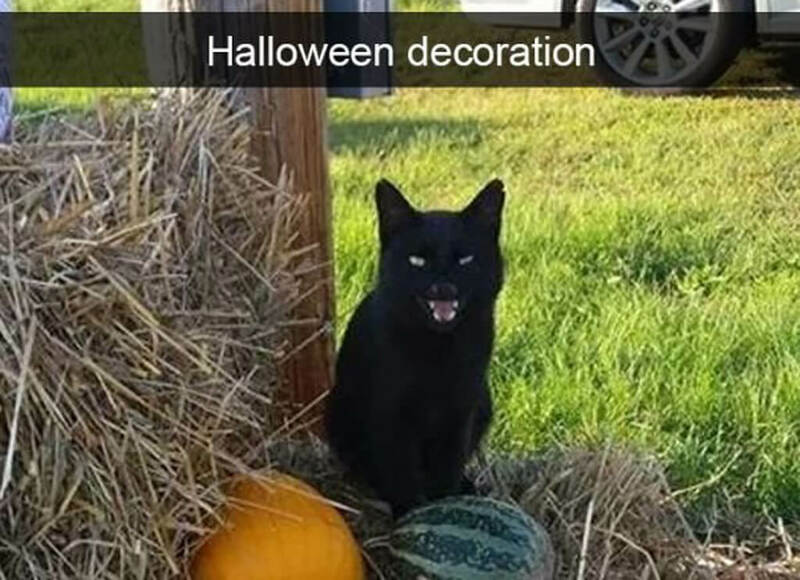 Now, I didn’t use to believe in all of those black cat associations with Halloween, but now I’m not so sure. this cat looks like it knows exactly what it’s doing. For all we know, this is a shape-shifting witch that managed to find herself on someone’s Snapchat. We just hope that whoever took this picture managed to get away without having something supernatural happen to them. Unless it’s Binx from Hocus Pocus, I’d love to meet him. It’s more than likely that this person walked out to their balcony to enjoy a cup of coffee only to see this. I’m not sure if I’d be confused, scared, or both. There’s something about two cats that make it much more intimidating than just one. Especially, when they’re looking at you like that, there’s no telling what’s about to happen. We wouldn’t be surprised if they even started speaking English and acting like you’re interrupting them. Wow. 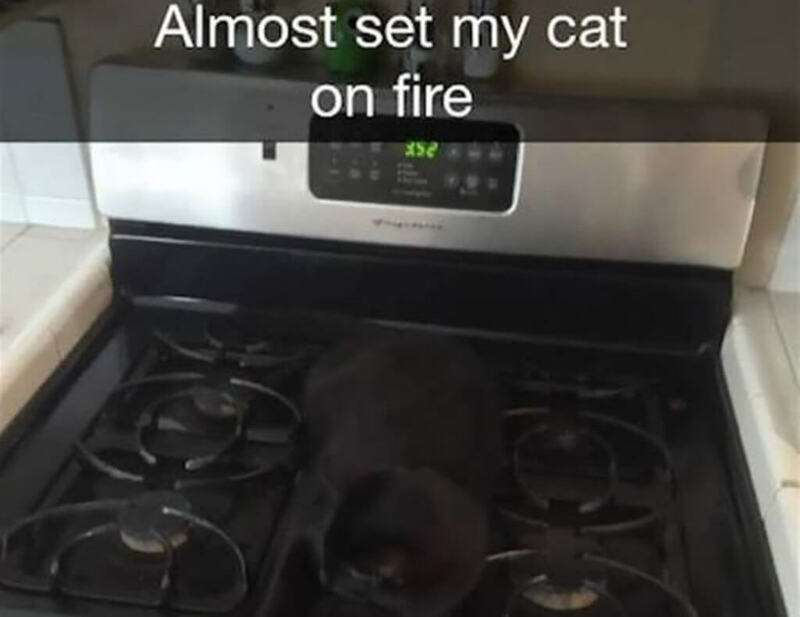 This cat really is lucky that its owner happened to realize that it was laying on top of the stove! Most people might not have noticed that but we’re happy that this owner did. 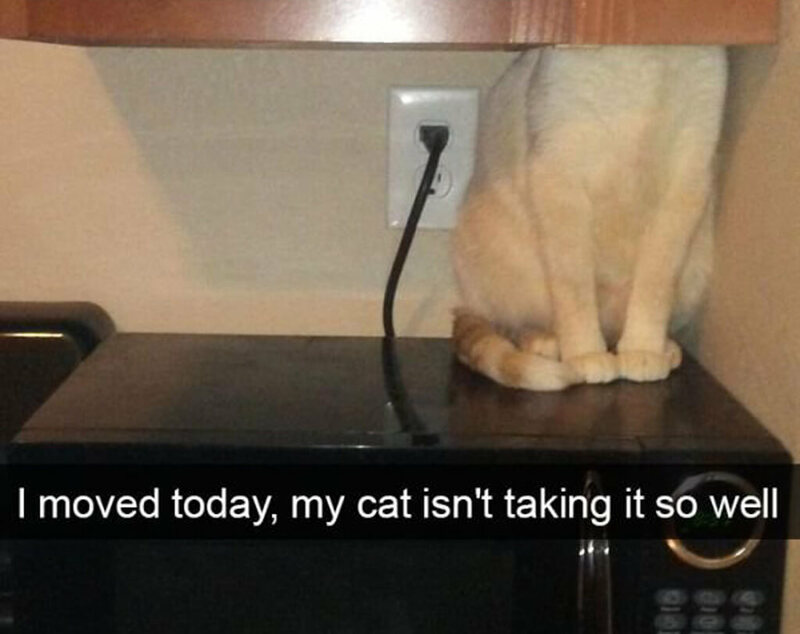 We don’t think that the cat could have been too happy if they had suddenly set the burner on high. They definitely would have realized that the cat was there then! Maybe next time, the cat should find a better sot to put its paws up and relax. We don’t blame this cat for wanting a little bit of peace and quiet. It’s a hard life being a cat and sometimes the only remedy is to put a bad on your head to shut everything out. Judging by the beer bottle on the table, it’s possible that its owners were partying and this cat was caught in the middle of it all. It’s either that or maybe the cat was the first to pass out. poor little guy. It’s known that cats tend to be vocal whenever they’re unhappy about something. Whether it’s crying or shunning their owners, they’re the first to let you know when something isn’t going their way. This cat appears to be shunning its owner or hiding from the new place that it will have to learn how to call home. For all we know, it may have just discovered its new favorite spot to let their owner know that they’re not happy. What this person fails to realize is that the planning is done. All this cat is waiting for is for them to fall into the trap. We’re not sure what this person did to this cat, but it’s clear that the cat is not happy with them at all. 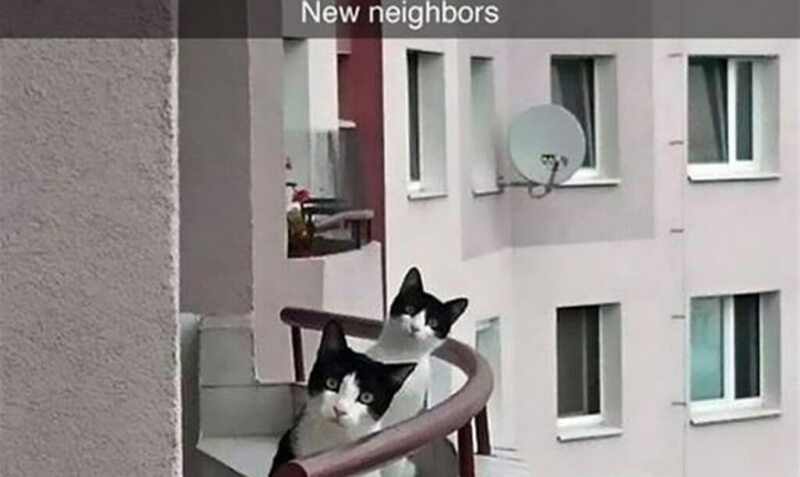 They better bring over some milk and treats next time that they come over or else there may not be the next time. Hope that their trap hasn’t already been put in motion before then. 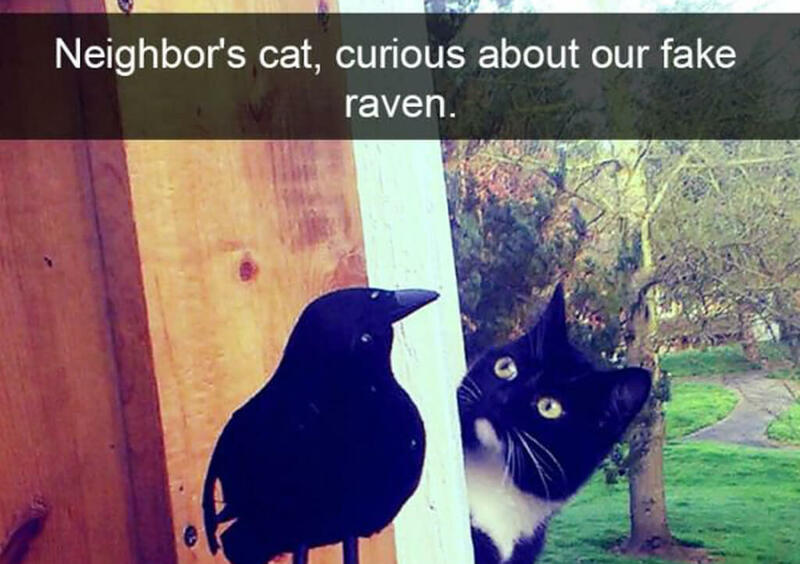 This cat looks like it’s in disbelief that this fake bird hasn’t flown away yet. It’s probably planned to catch a big bird like this its whole life and now it’s standing right in front of him like a sitting target. We wish that we could have seen how this whole situation played out. Maybe the cat attacked the fake bird, or maybe the two just had a stare off until the cat got bored. They should start putting fake birds up more often. If this cat is like any other, it is not going to be pleased when it wakes up. Actually, it’s going to completely flip out and probably jump up to the ceiling. Cat’s certainly do not like being disturbed, especially when they’re sleeping. We wouldn’t be surprised if it went straight for the owner’s face after it realized that it was their doing. 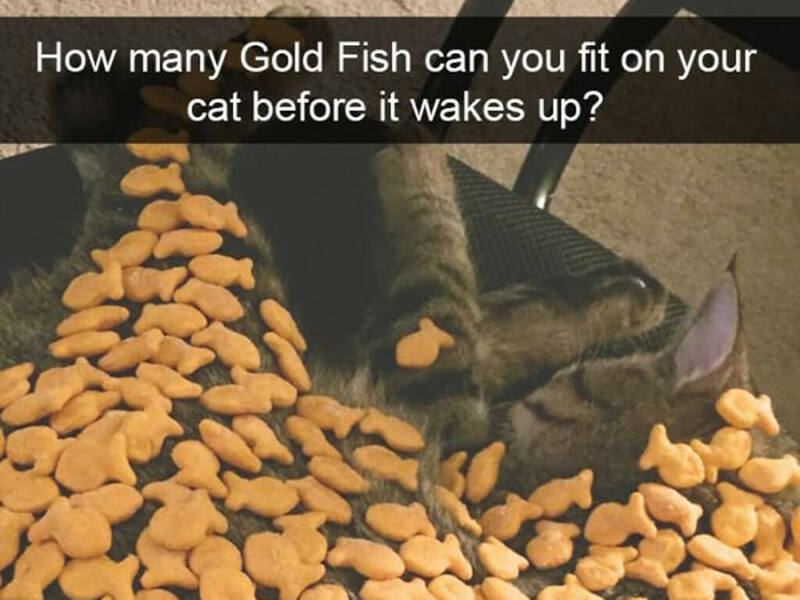 On the bright side, maybe this cat likes goldfish and will have itself a little post-nap feast. 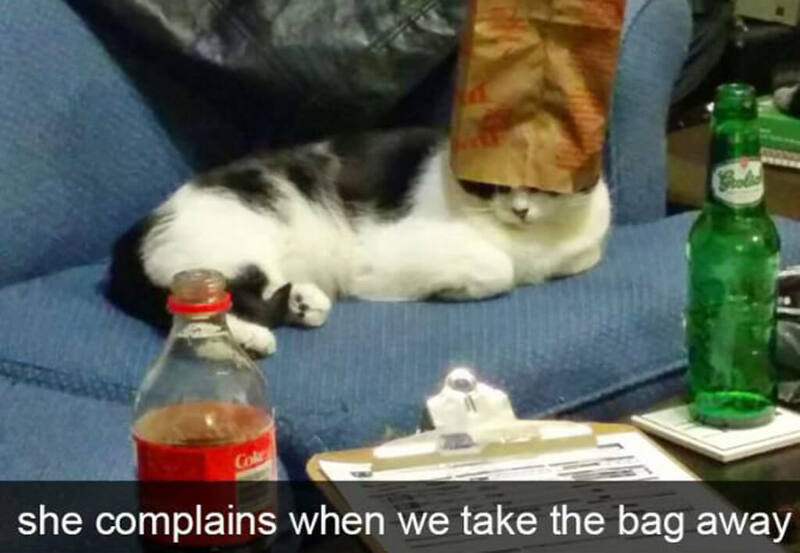 We honestly can’t tell if this cat is happy or bothered by its current situation. We can’t imagine that not being the most comfortable thing ever. But then again, cats like to have their freedom and this cat isn’t going anywhere right now. 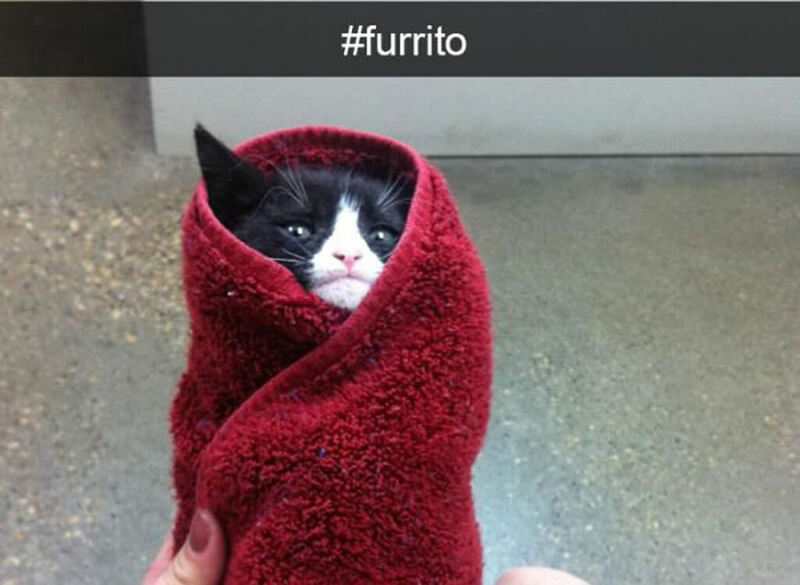 That being said, that is the cutest furrito I have ever laid eyes on. The internet needs to see more of these because it’s exactly what we all need. just try not to eat it! Not So Smart Now, Are You? Cats have proven themselves to be incredibly intelligent animals time and time again. Whether it’s getting what they want or annoying their owners, they are masters of their craft. However, it looks like moving the screen door really stumped this cat who now has no idea whether he’s inside or outside. 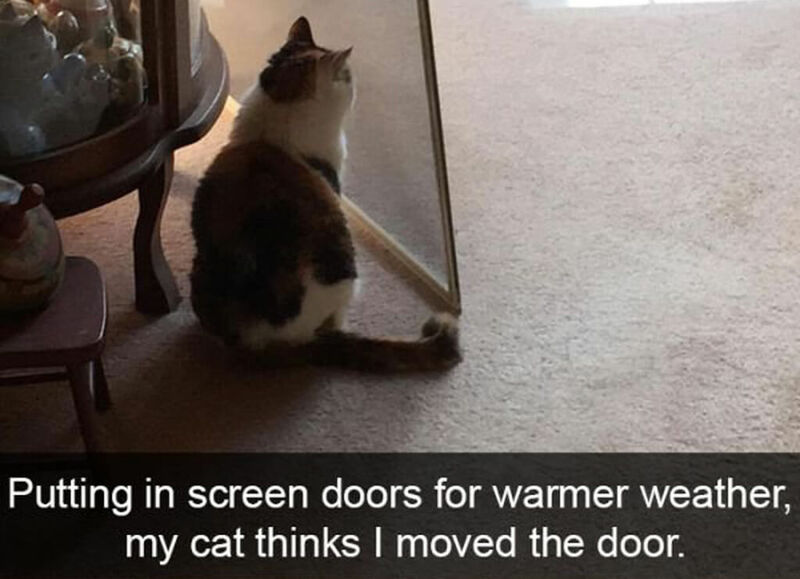 Hopefully, the owner showed him what had happened or else this cat might have a long summer staring out of that screen in the middle of the living room. 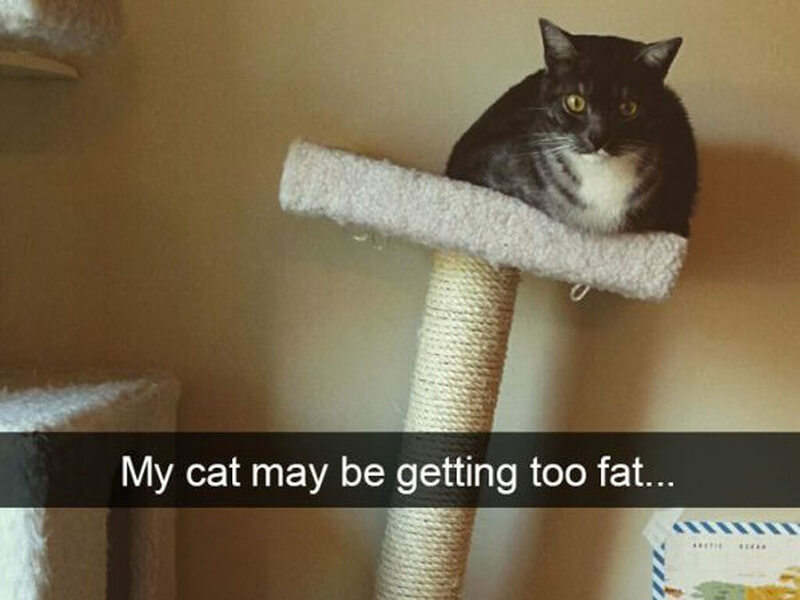 This cat looks good and knows it. We know that cats have the ability to essentially shape fit to get to where they want to go or to get comfortable. 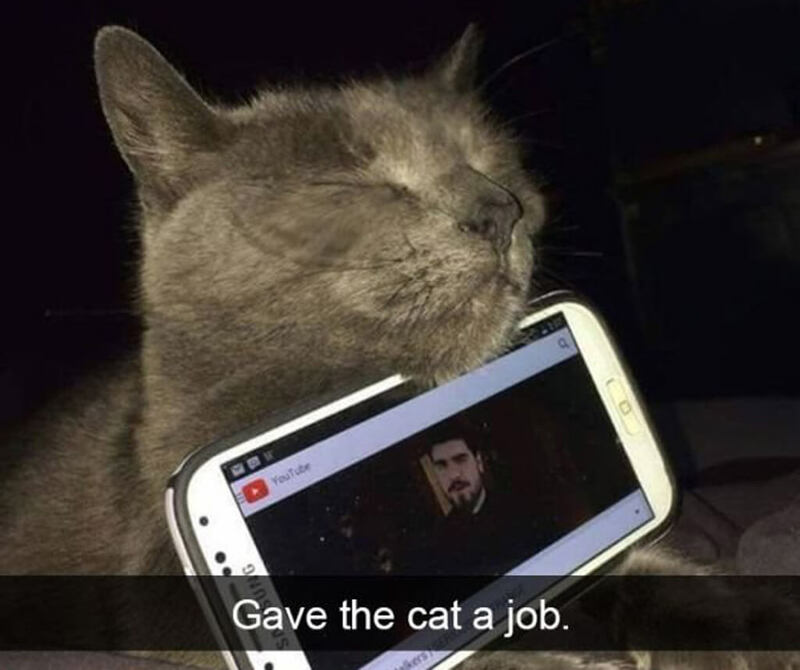 This cat didn’t even go through all that hassle. It decided to think outside of the box and start a new trend. They just used their teeth to cut out a little arm space. Now they look like the sexiest cat around. This should be on the cover of a GQ cat-edition magazine this cat looks so good. While this cat was just been exploring what the inside of a paper towel roll looked like, is owner seized the opportunity to take a hilarious picture. The picture works perfectly because of the cats orange fur, and the cat’s facial expression makes the whole thing glow. 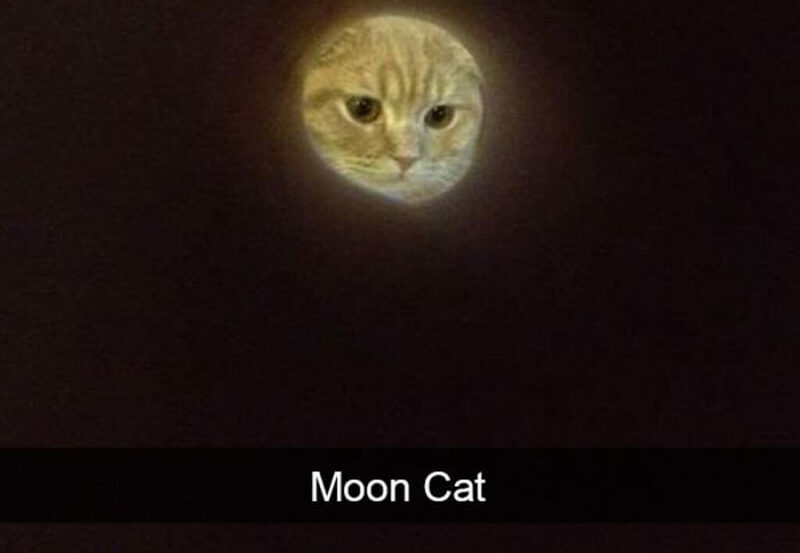 If I were the owner, I would re-create the kids’ book Goodnight Moon except replace the illustration of the moon with this picture of moon cat. We’re sure that would be a top-seller in no time. The owner of these pets seems to have caught them in the act of doing *something* they shouldn’t be doing. 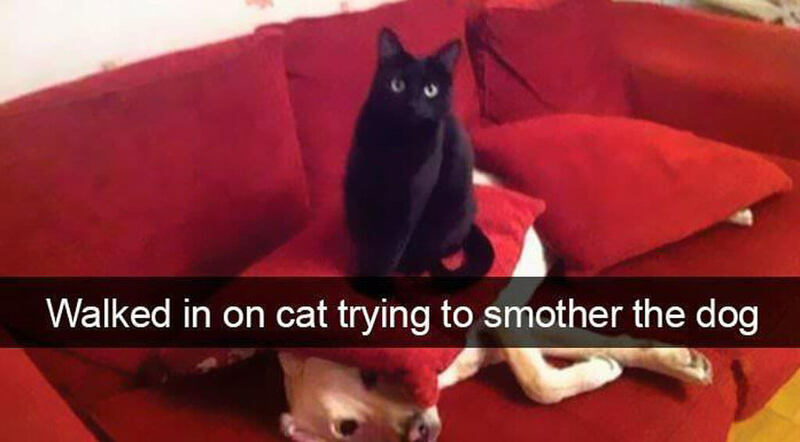 According to this Snapchat post, the cat is smothering the dog. Which seems completely plausible. Cats are known to hate dogs, after all. And this one is definitely sitting on top of a pillow, with the cute doggo underneath. We’re going to give this cat the benefit of the doubt here, though, and say that it’s giving the dog a nice relaxing massage. Some newfangled kind of pillow massage. Yeah. 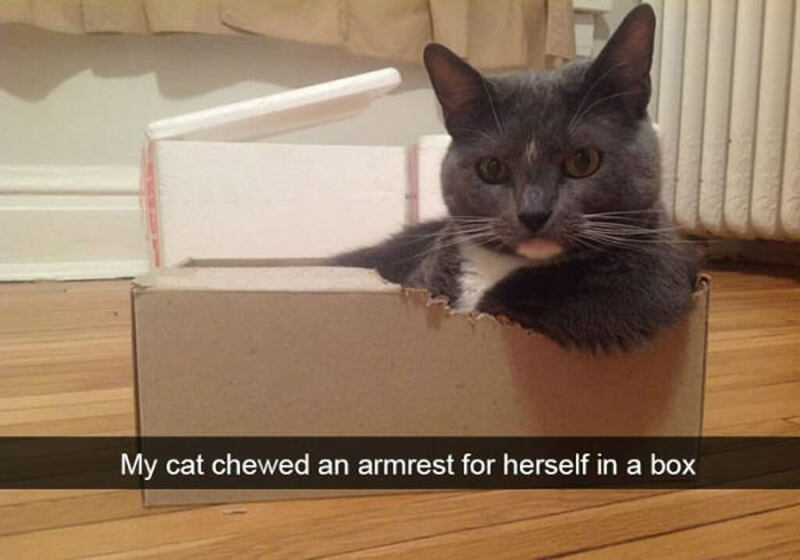 Was the cat trained to do this? Does the guy have a fear of using the bathroom alone? Either way, if this setup works for them we’re cool with it.